Though some bouts of insomnia didn’t help, I have managed to complete this year’s Holiday Card. Thus, I am happy to announce that 2018’s Holiday Card, which is simply titled Four, is now available! Four is somewhat different from previous Cards, though it shares some of their underlying spirit. I can’t say what inspired this year’s card, as I don’t entirely know; the idea just sort of popped into my head one day. However, I suspect it was a combination of factors, including certain current events. As stated on the game’s project page, my original idea was something quite different, both in terms of concept and execution. 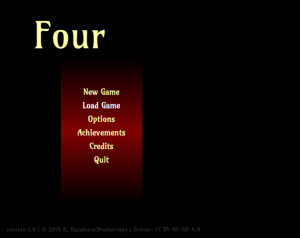 Regarding what Four is about, well… you’ll just have to see for yourself. Hope everyone is enjoying the holiday season, and here’s wishing you all a great 2019! ETA (Dec. 5, 2018): A small bug fix was made to Four, which will likely affect save files. The older version of the game has been preserved here, via the project’s page, but not on itch.io. Please see this post on itch.io for more details.